Transparency Market Research delivers key insights on the food wrap films Market in its published report, titled “Global Food Wrap Films Market: Industry Analysis and Opportunity Assessment, 2018–2026”. 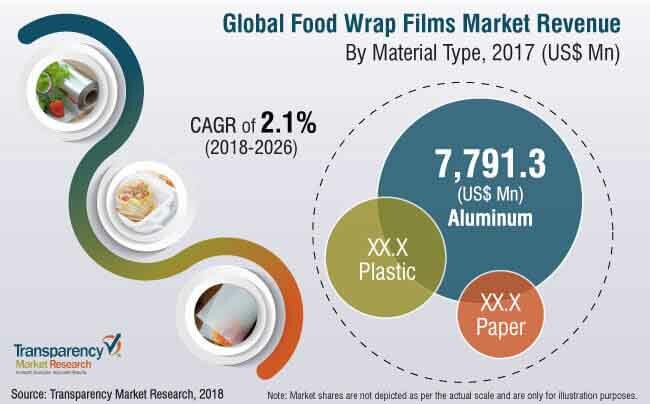 In terms of revenue, the global food wrap films market is estimated to expand at a CAGR of 2.1% during the forecast period, owing to numerous factors, about which TMR offers thorough insights and forecasts in this report. Food wrap films are used to wrap food products to protect them from contamination, keep food fresh and enhance the shelf life of the food. Food wrap films are generally used for short-term preservation of prepared food. Besides, they are also used to package confectioneries like chocolate and to wrap processed food to keep them fresh for an extended period. Furthermore, food wrap films are used to pack ready-to-eat food. The global market for food wrap films market is segmented as per material type and end use. The growing demand for on-the-go food and requirement of the increased shelf life of food from the consumers is acknowledged as a critical factor driving the food wrap films market. On the basis of material type, food wrap films are segmented as aluminum, plastic & paper. Among these aluminum type of food wrap films accounts for the most significant share. On the basis of end-use, food wrap films are segmented into retail, food service and food processing. Food service segment is expected to dominate the market share in the forecast period 2018-2026. The North America food wrap films market includes country level analysis for the U.S. and Canada. The Canada food wrap films market is anticipated to register higher CAGR during the forecast period as compared to that of U.S. due to the maturity attained by the demand for packaged food in the country. Aluminum is expected to dominate the food wrap films market in North America. Food service is estimated to lead among the end-uses for food wrap films for the forecast period. The Latin America food wrap films market includes country-level analysis for Brazil, Mexico and rest of Latin America. In Latin America food wrap films market, Mexico is projected to register the highest growth rate for the forecast period. Brazil is expected to dominate in terms of market share by the end of 2018. The Europe food wrap films market includes country-level analysis for Germany, Italy, U.K., France, Spain, Benelux, Nordic, Russia, Poland and Rest of Europe. Germany, Italy, France, and U.K. are estimated to collectively account for more than half of the Europe market share by the end of 2018. Benelux is projected to have the highest CAGR during the forecast period. The Asia Pacific food wrap films market includes country-level analysis for China, India, ASEAN, Japan, Australia & New Zealand and Rest of APAC. China and India are projected to register the very high CAGR by the end of forecast period. Aluminum segment is expected to dominate the APAC food wrap film market. Plastic is estimated to have the highest incremental opportunity in global food wrap films market. The Middle East and Africa (MEA) food wrap films market include country-level analysis for GCC, North Africa, South Africa and Rest of MEA. GCC is estimated to dominate MEA food wrap films market share during the forecast period. Plastic-type food wrap films are projected to register the highest CAGR. Key players operating in the global market for Food wrap films include Reynolds Group Holding Limited, Mondi Group, Mitsubishi Chemical Holdings Limited, Amcor Limited, United Company RUSAL Plc, Hindalco Industries Limited, Berry Global, Inc., Georgia-Pacific LLC, Huhtamaki Oyj, and Thong Guan Industries Berhad. In this report, we have discussed individual strategies followed by these companies regarding enhancing their product portfolio, creating new marketing techniques, mergers, and acquisitions. The ‘Competitive Landscape’ is included to provide report audiences with a dashboard view and company share collectively.